A colorful, dark color scheme, inspired by ir_black and twilight (vimscript #1677). If you can’t change your terminal’s colors, set g:jellybeans_use_lowcolor_black to zero in your .vimrc to render ‘black’ text as grey. See https://github.com/nanotech/jellybeans.vim for full option documentation. Issues and pull requests are welcomed. Once installed, run ":colorscheme jellybeans" to switch immediately and add "colorscheme jellybeans" to your .vimrc to persist the setting. jellybeans.vim 1.5 2012-01-16 7.0 NanoTech Colors added for Debugger.vim, Lua, ColorColumn, and vim-indent-guides. 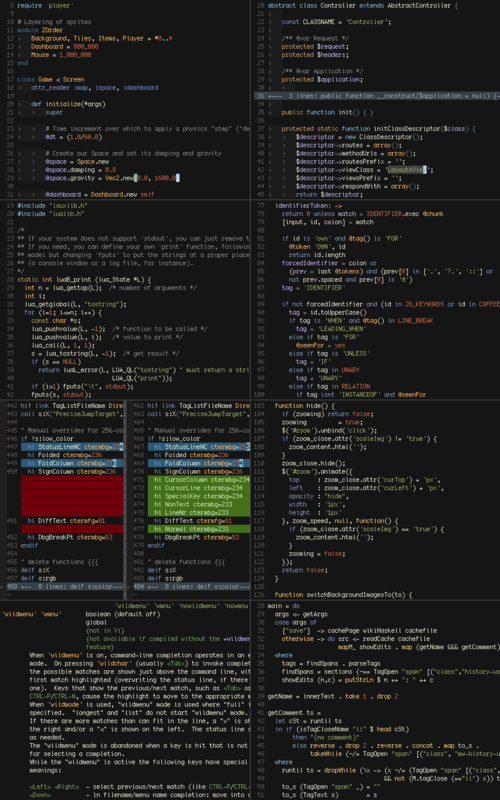 Improved colors for diff, FoldColumn, SignColumn, Objective-C, and terminal Vim. New option to disable use of foreground black on 16 and 8 color terms (let g:jellybeans_use_lowcolor_black = 0). jellybeans.vim 1.4 2011-04-11 7.0 NanoTech Colors added for WildMenu, spell checking, MoreMsg, Question, CoffeeScript, and PreciseJump. Improved colors for the auto-complete menu, diff, Ruby, and 256 and 16 color modes. Various other tweaks and fixes. jellybeans.vim 1.3 2010-10-26 7.0 NanoTech Improved coloring of C, Objective-C, splits, and non-printable characters. jellybeans.vim 1.2 2009-05-28 7.0 NanoTech Added support for 256-color terminals.